Three wheels on her wagon...and Theresa May rolls into another week of votes that might (or might not) prove to be crucial to the outcome of Brexit. The next vote on whether to approve the PM's Brexit deal is scheduled for Tuesday, with Commons leader Andrea Leadsom cheerfully insisting that she will only schedule the two other votes promised to MPs - on a no-deal exit and asking for Brexit talks to be extended - if the government loses the first. The brief burst of Tory optimism that some formula could be found to finesse objections to the Irish border backstop plan in the deal has now receded, and most observers expect MPs to vote down the government's proposed withdrawal agreement and declaration on the future UK-EU relationship, for a second time, although perhaps with a smaller margin of defeat. At that point, ministers will be expected to rewrite the Commons schedule, to make room for those two further votes, and there will be hell to pay if they do not. Although there is also talk that the government may attempt to retake the initiative, by proposing a structured series of votes to allow MPs to work their way through different Brexit options. The expectation is that vote number two, on 'no deal', expected on Wednesday, would result in that option being voted down by a considerable margin - although it will be interesting to see the numbers, and there may be strains if the government seeks to keep the option available. The third vote, expected on Thursday, will be the hardest to call - the vote on a postponement of Brexit Day. The prime minister says any prolongation of the Brexit talks should be a "short, limited extension", and "would almost certainly have to be a one-off". 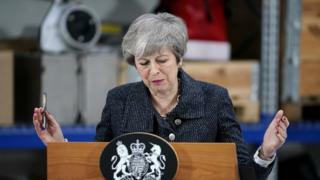 Both motions will be amendable - and while the no-deal vote is unlikely to be complicated by amendments, because its opponents want it defeated cleanly, and by the biggest possible margin, there could be any number of amendments in play when the extension of the negotiating period, and therefore the postponement of Brexit, is voted on. So divisive is that final vote that the Conservatives, in particular, may decide not to impose a whip - not least because whichever way they instructed their MPs to vote, there would probably be ministerial resignations from one faction or the other. But just pause for a moment. This would be a government conceding that it was unable to whip its troops - indeed its ministers - on its central policy. It would be a massive admission of weakness, highlighting the disintegration of normal collective responsibility in the government and tribal loyalty in the wider party. And it would be very hard to press some magic reset button and restore normal working methods - perhaps only a new leader could do it. Labour, on the other hand, have previously voted for amendments which would have the effect of postponing Brexit to allow for more negotiation, and seem likely to do the same. That certainly wouldn't stop some Labour MPs rebelling, and voting against postponement - so the result then depends on the size of the anti-delay factions in the two big parties. And just to make things more complicated, the Thursday vote looks like the moment for all kinds of amendments, both on what outcome should follow (a so-called Norway option or a "managed no-deal" maybe) and on the process to be followed in future - including whether there should be a longer delay than the very limited one the PM is expected to propose. Look out for attempts to revive the idea of having a series of indicative votes on Brexit alternatives. At every stage, the lists of who voted for what will provide plenty for the parliamentary analysts to chew on - and the voting behaviour of one particular MP will attract particular attention: the Rt Hon Member for Maidenhead, one Theresa May. Will she want to be in the position of voting for a postponement of Brexit, when she has said (by some estimates) more than a hundred times, that the UK would leave on March 29? Or might she be in Brussels, or some other distant destination, and therefore unable to take part in the vote? All of this underlines the lack of a majority for anything - the PM's deal, the Norway model, a second referendum, etc. A vote for postponement of Brexit is not a decision about where to go or what to do next. Which is why it is quite possible to imagine the PM's deal coming back, perhaps in the wake of the next EU summit, on March 21, for a last-gasp attempt to get it through. Just about every faction argues that as the deadline approaches, MPs will 'see sense' and a majority will crystallise around their favoured option. It is far from clear that they will. Meanwhile, in normal times, the week would be dominated by another event - the chancellor's Spring Statement. This is no longer the all-singing, all-dancing parliamentary showpiece that spring budgets used to be. Essentially it is an update on the government's finances, and there won't be tax changes to vote on or anything like that. But it still matters. The statement looks set to be centred on better than expected tax receipts, which will mean that ministers have a bit more largesse to dispense, to underpin their 'end of austerity' narrative. For now, anyway, because Brexit could transform the picture. The statement could also provide a first glimpse of a post-Brexit Conservative political narrative. Bear in mind that, although it seems far over the political horizon, the two-year parliamentary session which began after the 2017 election, is now coming to an end. At some point there will be a new legislative programme, to be announced in a new Queen's Speech, providing a chance to talk about bread and butter issues, rather than Brexit. Inquiring minds will be focussing on that. Just one other intriguing question...will this be Philip Hammond's last big moment as chancellor? Will there be a new occupant of 11 Downing Street come the Budget in the autumn? Anyway, here's my rundown of the week ahead. Take it with a ton of salt, because the timetable will be totally rewritten, if the government does indeed lose the vote on Tuesday. The Commons opens (2.30pm) with Education Questions, doubtless to be followed by the usual crop of post-weekend ministerial statements and urgent questions - with the possibility of a statement from Attorney-General Geoffrey Cox on the outcome of his attempts to find a new formula to solve the Northern Ireland backstop issue. The main legislative action is the report and third reading stages of the Children Act 1989 (Amendment) (Female Genital Mutilation) Bill [Lords]. This is the private member's bill put through the Lords by the crossbench peer Lord Berkeley of Knighton, and the Commons by the Conservative MP Zac Goldsmith. It makes a one-line amendment to the Children Act 1989, to allow the family court to make an interim care order to protect girls at risk of genital mutilation. There was a considerable row when the Conservative Christopher Chope objected to the bill being being given initial approval without debate, and the government found time for it to be considered. In Westminster Hall (4.30 pm) there's a Brexit appetiser, as MPs debate an e-petition calling for the UK to withdraw its notice of leaving the EU if "there is no Brexit plan by the 25 of February". The government's policy is not to revoke Article 50. Ministers say they will continue to work with Parliament to deliver a deal that ensures the UK leaves the EU as planned on March 29th. On the committee corridor there's more Brexit - with Brexit Secretary Stephen Barclay appearing before the Exiting the European Union Committee (12.15pm) to discuss the role of Parliament in the Brexit process. The committee is expected to question him about his recent discussions with the European Commission's chief negotiator Michel Barnier, ahead of a second 'meaningful vote'. The committee will also seek an update on government preparedness for a no-deal scenario, as well as the possibility of an extension to the Article 50 process. And away from Brexit, the Housing, Communities and Local Government Committee continues its inquiry into funding of local authorities' children's services (4pm) questioning independent care providers on their role, and quizzing ministers Rishi Sunak and Nadhim Zahawi about the government's response to the funding pressures facing services. In the Lords (2.30pm), questions to ministers include one on the effect on diversity in the creative industries of low levels of provision of arts subjects at A-Level in deprived areas. The title of the main debate is "Further discussions with the European Union under Article 50 of the Treaty on European Union" - a chance for peers to air their views on the latest Brexit developments. Expect few surprises. A potentially momentous Commons day opens at 11.30am with Justice Questions - any statements or urgent questions added to the agenda would probably need to be pretty urgent. The day's ten minute rule bill, proposed by the Conservative Craig Mackinlay is the Election Expenses (Authorisation of Free or Discounted Support) Bill - which is effectively an attempt to reverse a Supreme Court ruling on which expenses should count towards a candidate's spending in a constituency during a General Election campaign. This was part of the case against him when he was taken to court over his election spending - he was acquitted, but a national Conservative official was found guilty. It's a highly technical issue, regarding the distinction between national and constituency campaign spending, but one in which all the political parties have a direct and lively interest. Incidentally, the Public Administration and Constitutional Affairs Committee has just announced an inquiry into the state of electoral law - underlining the level of concern about it in Parliament. In Westminster Hall, the opening debate (9.30am) is on fire safety and sprinkler systems - Labour MP Jim Fitzpatrick, who has campaigned on fire safety issues for quite a while now, wants to highlight the need for a legal requirement for sprinkler systems, particularly in tower blocks and buildings housing vulnerable people. He will also point to what he regards as the much more effective safety regulations in Scotland and Wales. Other subjects for debates include: NHS treatment for depersonalisation disorder (11am); the interdependence of modern farming and the environment (2.30 pm); online gambling protection (4pm) and lower earnings limit for automatic enrolment (4.30 pm). On the committee corridor, the Treasury Committee (9.15 am) takes evidence on the access to cash review - an independent look at consumer requirements for cash over the next five to fifteen years led by the former head of the Financial Ombudsman Service, Natalie Ceeney. As use of debit card and digital payments replaces notes and coins, the review has been examining the effects on consumers, particularly the estimated 2-3 million people across the UK who are entirely reliant on cash. In the Lords (2.30 pm) the main event is detailed report stage consideration of the Healthcare (International Arrangements) Bill - which came in for considerable criticism at the earlier committee stage. Report stage is where the main action tends to occur - and there are amendments down to limit the government's ability to strike healthcare deals beyond those needed to replace existing agreements with the EU. Peers will also debate all the legislative stages of two bills on Northern Ireland issues, needed because of the absence of a devolved Northern Ireland Assembly and Executive - the Northern Ireland (Regional Rates and Energy) (No. 2) Bill , and the Northern Ireland Budget (Anticipation and Adjustments) (No. 2) Bill. Another big Commons day opens (11.30am) with half an hour of questions to Cabinet Office Minister David Lidington, followed by Prime Minister's Question Time at midday. The day's ten minute rule bill, from Labour's Lloyd Russell-Moyle, aims to set up a national deposit and arbitration scheme for tenants in rented homes. Then the chancellor delivers his Spring Statement. This is not a fiscal event like the Budget, so he won't be making big announcements on spending or taxation, and no votes will follow. Instead, the chancellor will reveal the latest OBR forecasts for the economy and may refer to any headroom he has for the forthcoming Spending Review. And he might make a few comments about the prospect of the UK leaving the EU without a deal - a subject MPs will probably debate and then vote on, when the discussion of the Spring Statement is over (see above). The current agenda suggests there will be a general debate on housing - normally a subject which would attract plenty of interest, but it could well be cancelled in favour of that vote on no deal. In Westminster Hall, Grimsby Labour MP Melanie Onn leads a debate on fishing and Brexit (2.30pm). In the Lords (3pm), peers resume their detailed consideration of the Trade Bill, fresh from peers voting through a call for the government to negotiate a new customs union with the EU, which was won by 207 votes to 141, a majority of 66. Labour will be following up with an amendment seeking to sign the UK up to continue participating in a series of EU bodies including the European Medicines Agency, the European Aviation Safety Agency, the European Chemicals Agency, and the European Data Protection Board. There is also a cross-party amendment spearheaded by Labour former Northern Ireland Secretary Lord (Peter) Hain, aimed at preventing the creation of a "hard border" between Northern Ireland and the Republic. MPs begin their day (9.30 am) with half an hour of International Trade Questions, followed by Women and Equalities Questions. Then the Leader of the House, Andrea Leadsom, will announce the Commons agenda for the following week. Again, the business currently on the agenda - a Backbench Business Committee debate on the NICE appraisal processes for rare diseases could well be cancelled in favour of a motion on a postponement of Brexit day. In Westminster Hall (1.30pm), MPs debate a Scottish Affairs Committee report on the future of the oil and gas industry. Justice Minister Ed Argar and Education Minister Nadhim Zahawi will be before the Joint Committee on Human Rights (3.15pm) talking about children whose mothers are in prison. In the Lords (11am), question time includes the Lib Dem Lord Clement-Jones, who chaired a committee which studied the impact of decision-making by artificial intelligence, asking about the standards and certifications for the algorithms used in decision-taking by public authorities and agencies. Then peers will be invited to rubber-stamp the Supply and Appropriation (Anticipation and Adjustments) (No. 2) Bill - this is a money bill and by convention, peers do not interfere with this kind of legislation. They will then debate at least nine statutory instruments on subjects ranging from the Draft Mobile Roaming (EU Exit) Regulations 2019 to the Draft Food and Feed (Chernobyl and Fukushima Restrictions) (Amendment) (EU Exit) Regulations 2019. It's private members' bill day in the Commons (from 9.30am), with the first business dealing with Lords amendments to the Civil Partnerships, Marriages and Deaths (Registration etc) Bill - a bill from Conservative Tim Loughton which has had a few uncontroversial amendments added in the upper house, which the Commons must agree to. Then MPs will turn to the report and third reading stages of the Holocaust (Return of Cultural Objects) (Amendment) Bill, from Conservative MP Theresa Villiers. This should be a fairly rapid affair, with no amendments proposed, and cross-party support. But the bill is an interesting parliamentary curiosity: it is very rare for a measure which started life as a ten minute rule bill to make it into law, as this one seems likely to do, but the legislation it seeks to amend also started as a ten minute rule bill, proposed by Labour MP Andrew Dismore in 2009. His measure helps clear legal impediments to handing back artwork looted by the Nazis to their legitimate owners (some museum collections are hedged about with legal restrictions which make this difficult) but it was time-limited to last for ten years; this bill removes the time limit. After that, the House will turn to a couple of bills proposed by the Conservative MP Peter Bone. First there is the second reading of the Prime Minister (Accountability to House of Commons) Bill, which would bring back the pre-Blair system of having two (shorter) sessions of Prime Minister's Questions in the Commons every week, on Tuesdays and Thursdays. Mr Bone argues that this would make the prime minister more accountable to the House, and would ensure that Commons Thursdays were not 'fag-end' days with little significant business. Not content with that, he then moves onto the General Election (Leaders' Debate) Bill, which creates an Election Debates Commission, with representatives from the government, the opposition, the media and three members appointed by the Speaker. This would orchestrate three televised debates during a General Election campaign - one involving the leaders of all parties in the Commons, and two head-to-head encounters between the PM and the Leader of the Opposition. They would be under a legal obligation to take part.